You are currently browsing the Collector Model blog archives for October, 2017. Me, you ask? I am writing a series of postings to fill you in on just that. I’m sure you’ve heard about or seen some of it, but by the time this series is done (probably around Christmas time… which is never as far away as it seems) I’ll be filling you in on the new exciting kits we’ve started, but have not yet officially announced. So keep your eye on this space. 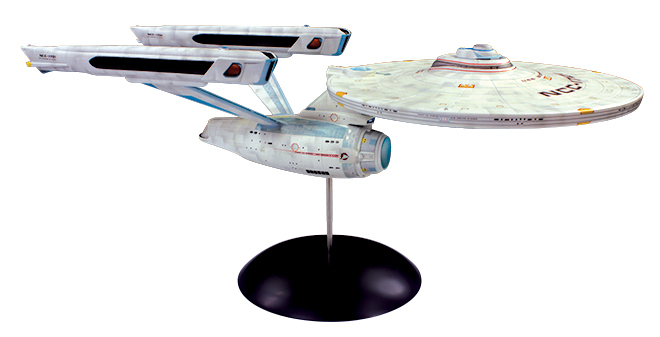 First, I’ll touch on the AMT Star Trek kit reissues we have coming out late this year and early next year. The first two were some of the latter releases by Round 2’s predecessor. 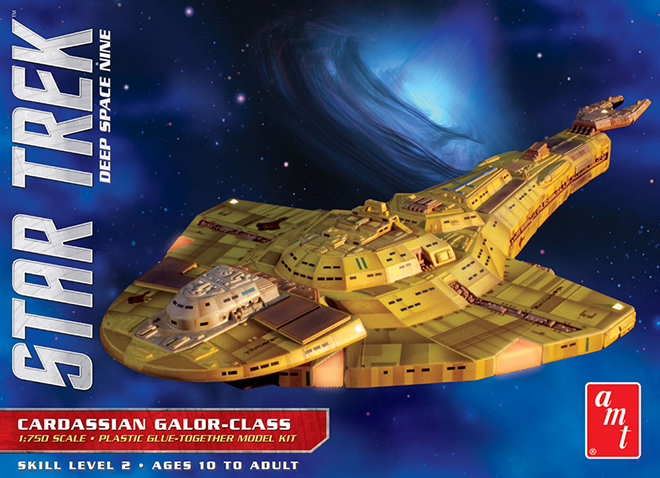 The Cardassian Galor-class has been out for just a little while now, and we haven’t really said much about it. 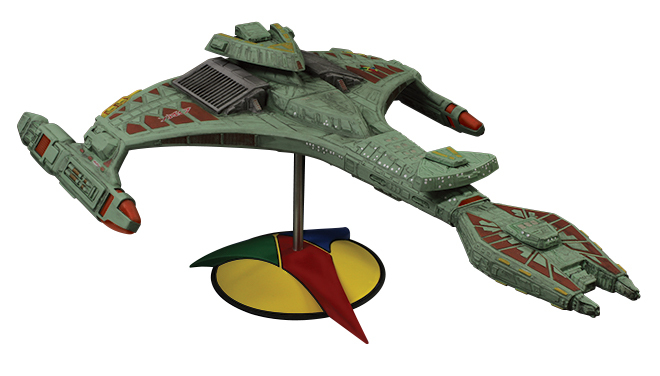 The primary change to the kit is the installation of a metal rod to support the ship atop its existing Cardassian logo base. However, this wasn’t the only change we made on this kit. As it turned out the clear tooling for the kit turned up missing. As we retooled the clear part we decided to make a change to small pyramidal parts. We added pegs to them and punched holes in the hull to accept them. This provides a slightly easier path towards lighting the kit. In addition to the kit itself, we also offer a full set of paneling/weathering decals as we do for some of our other kits. The decals are compatible with the original issue for anyone holding onto old copies. 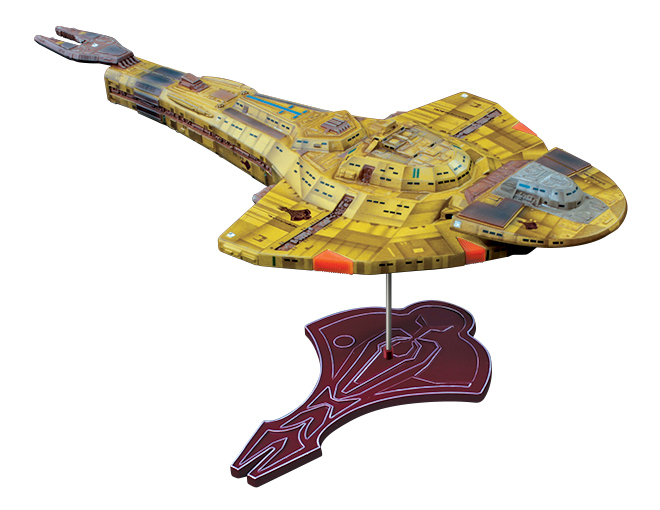 Next, we have the Klingon Vor’cha Battle Cruiser. Like the Galor, the clear parts tool was lost and retooled though they are made to seamlessly replace the originals. And again, we added a metal support rod to be used with the original Klingon base. Both kits build great representations of these spacecraft. 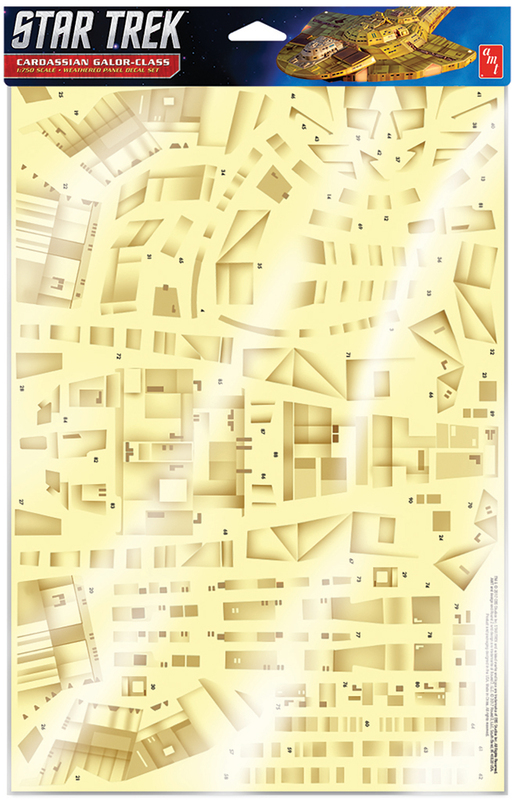 Proportions are accurate and each provides a great level of detail. 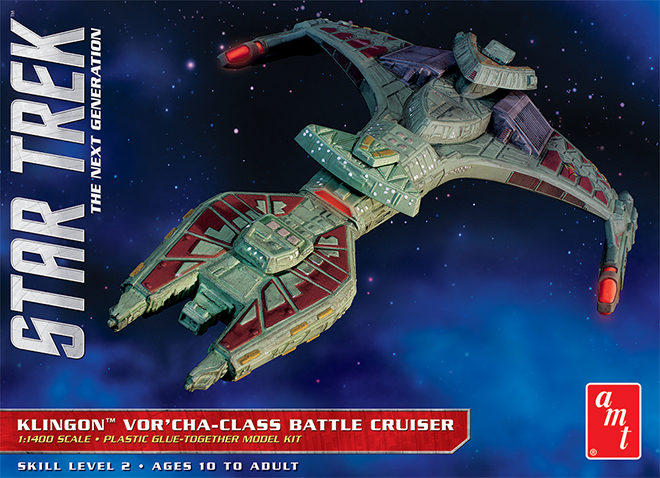 Look for the Vor’cha in December. 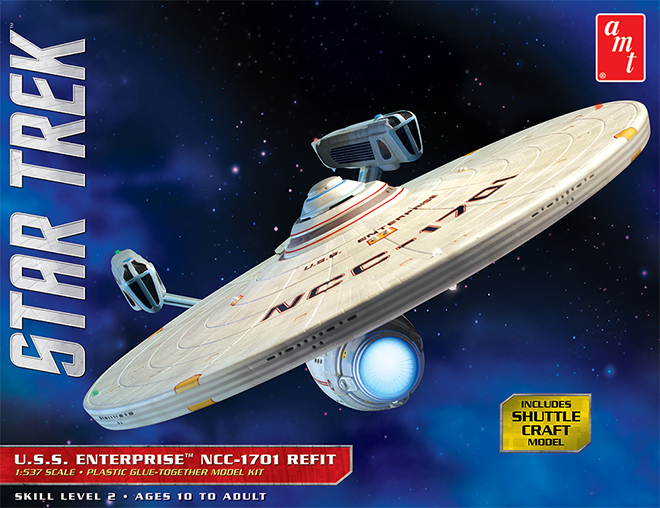 The new year brings a re-issue of the AMT Enterprise Refit. It has been popular with modelers that like a medium-scale model that want something more substantial than our 1:1000 snap kit, but may not have the room for our big 1:350 scale kit. At 22” it is a great size. The kit will still feature the surface paneling detail. We priced out fixing that some time ago and found that we would essentially need to start tooling from scratch and opted to tool up the 1:1000 kit instead. We are adjusting the base to use the metal support tube with our larger dome base. The decal sheet will be upgraded from previous releases, but won’t include full Aztec decals since applying large decals over the paneled surface might prove to be problematic for some modelers. We have included strongback decals in soft blue that mimic the onscreen look of the ship. 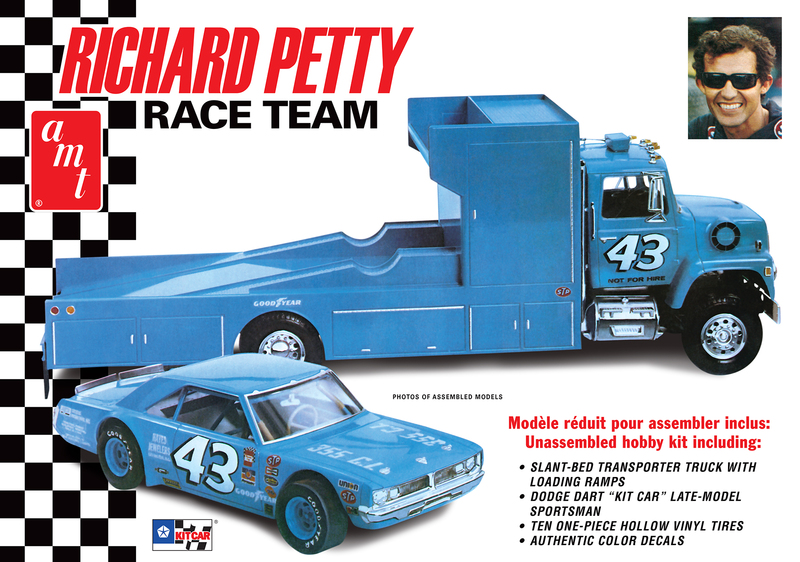 AMT is excited to announce that we’re bringing back another classic kit for all the stock car fans out there—the Richard Petty Race Team! Featuring two full kits packed into one box, this kit includes: a slant-bed transporter truck with loading ramps AND the Dodge Dart “Kit Car” Late Model Sportsman, offering everything a Petty fan could ask for in a model kit. 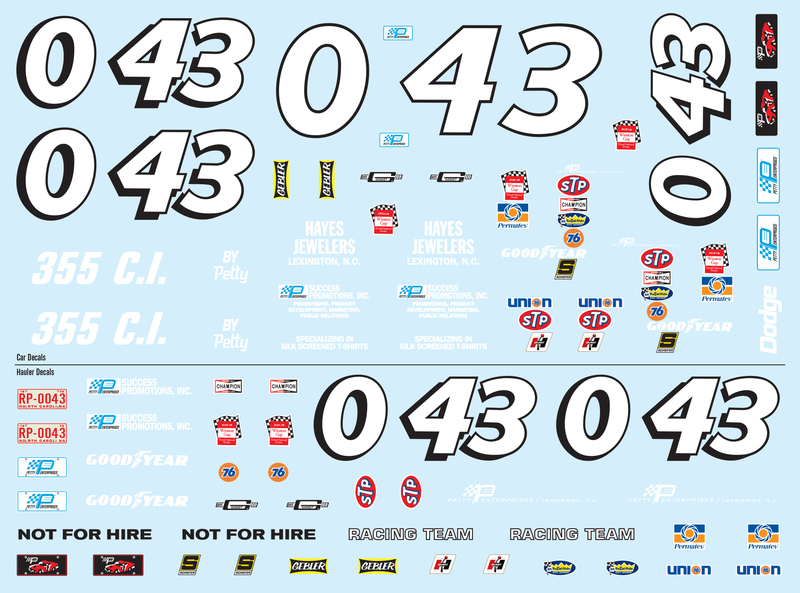 Not to mention, we’ve also thrown in complete decal sets for each vehicle, and two extra stock car tires, which can be stored on the hauler. So grab your glue and Petty Blue paint, cause this kit is racing into hobby stores near you, and online, in just a few short weeks!